Whether or not a given isotope is radioactive is a characteristic of that particular isotope. Some isotopes are stable indefinitely, while others are radioactive and decay through a characteristic form of emission. As time passes, less and less of the radioactive isotope will be present, and the level of radioactivity decreases. An interesting and useful aspect of radioactive decay is half-life, which is the amount of time it takes for one-half of a radioactive isotope to decay. The half-life of a specific radioactive isotope is constant; it is unaffected by conditions and is independent of the initial amount of that isotope. Consider the following example. Suppose we have 100.0 g of tritium (a radioactive isotope of hydrogen). It has a half-life of 12.3 y. After 12.3 y, half of the sample will have decayed from hydrogen-3 to helium-3 by emitting a beta particle, so that only 50.0 g of the original tritium remains. After another 12.3 y—making a total of 24.6 y—another half of the remaining tritium will have decayed, leaving 25.0 g of tritium. After another 12.3 y—now a total of 36.9 y—another half of the remaining tritium will have decayed, leaving 12.5 g. This sequence of events is illustrated in Figure 15.1 “Radioactive Decay”. 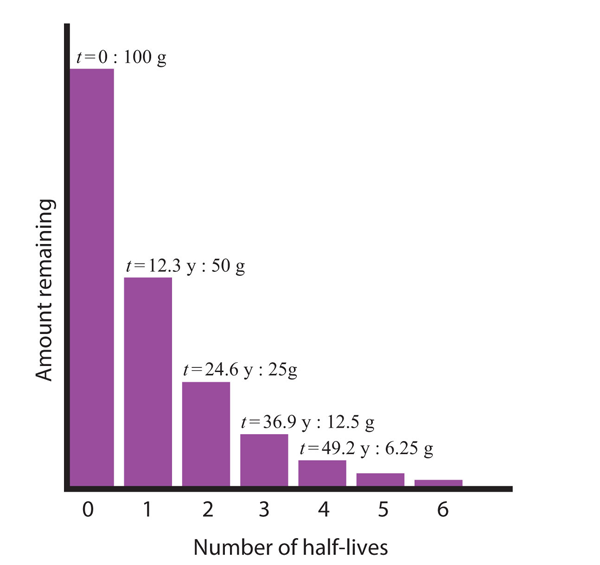 During each successive half-life, half of the initial amount will radioactively decay. Half-lives of isotopes range from fractions of a microsecond to billions of years. Table 15.2 “Half-Lives of Various Isotopes” lists the half-lives of some isotopes. Do all isotopes have a half-life? Explain your answer. Which is more radioactive—an isotope with a long half-life or an isotope with a short half-life? How long does it take for 1.00 g of palladium-103 to decay to 0.125 g if its half-life is 17.0 d? How long does it take for 2.00 g of niobium-94 to decay to 0.0625 g if its half-life is 20,000 y? It took 75 y for 10.0 g of a radioactive isotope to decay to 1.25 g. What is the half-life of this isotope? It took 49.2 s for 3.000 g of a radioactive isotope to decay to 0.1875 g. What is the half-life of this isotope? The half-live of americium-241 is 432 y. If 0.0002 g of americium-241 is present in a smoke detector at the date of manufacture, what mass of americium-241 is present after 100.0 y? After 1,000.0 y? If the half-life of tritium (hydrogen-3) is 12.3 y, how much of a 0.00444 g sample of tritium is present after 5.0 y? After 250.0 y? Explain why the amount left after 1,000.0 y in Exercise 7 is not one-tenth of the amount present after 100.0 y, despite the fact that the amount of time elapsed is 10 times as long. Explain why the amount left after 250.0 y in Exercise 8 is not one-fiftieth of the amount present after 5.0 y, despite the fact that the amount of time elapsed is 50 times as long. An artifact containing carbon-14 contains 8.4 × 10−9 g of carbon-14 in it. If the age of the artifact is 10,670 y, how much carbon-14 did it have originally? The half-life of carbon-14 is 5,730 y.
Carbon-11 is a radioactive isotope used in positron emission tomography (PET) scans for medical diagnosis. Positron emission is another, though rare, type of radioactivity. The half-life of carbon-11 is 20.3 min. If 4.23 × 10−6 g of carbon-11 is left in the body after 4.00 h, what mass of carbon-11 was present initially? Only radioactive isotopes have a half-life. Radioactive decay is an exponential process, not a linear process. Half-Life by Jessie A. Key is licensed under a Creative Commons Attribution-NonCommercial-ShareAlike 4.0 International License, except where otherwise noted.